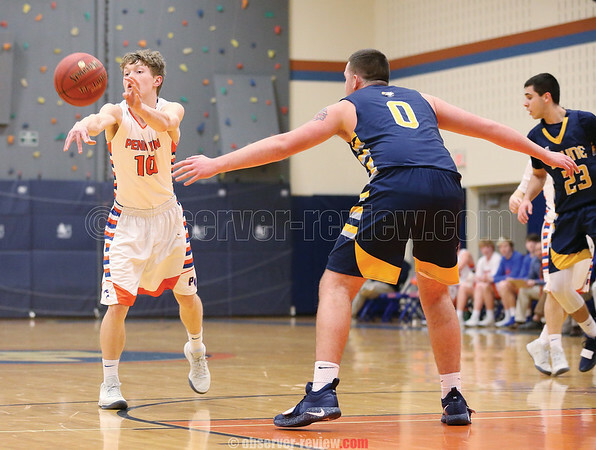 PENN YAN--The Mustangs' boys varsity basketball team lost to Wayne, Friday, Jan. 18. The final score was 70-53. Brennan Prather and Kyle Berna both scored 11 points. Conner Fingar and Colton Smith each netted eight points. Peter Nicholson added seven points. Peyton Shuck and Devon Gerhardt added three points each. Penn Yan topped Palmyra-Macedon, 50-43, Tuesday, Jan. 15. Berna netted 17 points. Nicholson scored 13 points. Smith added nine points, while Fingar had six points. Gerhardt earned three points. The Penn Yan girls varsity basketball team topped Wayne, 52-47, Friday, Jan. 18. Peyton Comfort posted 13 points, with seven rebounds and three assists. Jenna Curbeau and Sierra Harrison each scored 11 points. Curbeau also earned 11 rebounds and five assists. Ashley Sisson posted nine points and 15 rebounds. Jammie Decker added four points and seven rebounds, while Hayley Andersen scored three points. The Lady Mustangs fell to Palmyra-Macedon, 46-36, Wednesday, Jan. 16. Leading Penn Yan was Comfort with 18 points and seven rebounds. Curbeau and Sisson followed with six points, as well as four and three rebounds respectively. Joddie Decker contributed three points, five assists, and five rebounds, while Harrison earned three points, four rebounds, and three assists. Penn Yan beat Marcus Whitman, Monday, Jan. 14. The final score was 41-26. Sisson posted 10 points and 10 rebounds. Jammie Decker and Comfort both scored eight points. Joddie Decker earned five points, while Curbeau added four points and five rebounds. Andersen and Harrison each scored three points. The Penn Yan varsity bowling teams both topped Waterloo, Wednesday, Jan. 16. The girls won 5-0. Kari Ayers led with a 595, followed by Emilie Thomas with a 530. Andy Kniffin posted a 500. Brandee Ellis bowled a 445, while Mckelvie Jensen had a 441. The final score for the boys was 4-1. Zach Gurba bowled a 560 series. Jon Masheswske posted a 556, followed by Cameron Bassage with a 555. Connor Harmon earned a 521. Ben Broome added a 520. Both Mustangs' bowling teams beat Honeoye, 5-0, Tuesday, Jan. 15. Ayers bowled a 569 for the girls. Thomas contributed a 558. Jensen added a 449. For the boys, Harmon led with a 582. Trenton Samatulski posted a 514. Bassage added a 504. Broome earned a 448. The Marcus Whitman/Penn Yan combined varsity wrestling team took fifth at the Wayne-Finger Lakes Invitational, Friday, Jan. 18, to Saturday, Jan. 19. Jarred Calice (138) won the championship in his weight class, beating Wayne's Joshua Jones by a 6-5 decision in the finals. Justin Smith (132) finished second. Aiden Mowry (113) finished third, while Jayden Reed (126) was fourth. Dylan Howell (152) and Colton Yerkes (195) placed fifth. Evan Gray (120) and Charlie Burgess (138) were sixth. The combined wrestling team lost to Geneva, 38-35, Wednesday, Jan. 16. Gray (120) beat Aiden Fallo by decision, 6-5. Calice (138) defeated Beka Bekauri by major decision, 9-1. Charlie Burgess (145) beat Ty Coles by technical fall 15-0. Mason Peterrson (220) pinned Luvon Boykin in 1:08. Mowry (113), Justin Smith (132), and Chad Smith (160) won by forfeit. PENN YAN--The Dundee girls varsity bowling team beat Bloomfield, 5-0, Thursday, Jan. 17. Kayla Andrews led with a 427 series. Mercedez Roy posted a 405, while Edele Morgan added a 400. Sam Hunt earned a 381. Jaedyn Brewer posted a 354 series. The boys lost, 4-1. Connor Muck posted a 549 series. Stephan Smith followed with a 547. Hunter Murphy added a 527. The bowling teams both lost to Waterloo, Tuesday, Jan. 15. The girls lost, 5-0. Roy posted a 399 series. Andrews earned a 374, followed by Brewer with 369. Claudya Lyons bowled a 329. Cassie Morrissette added a 321. The final score for the boys was 3-2. Smith led with a 605 series, followed closely by Muck with 603. Murphy added a 544. The Dundee girls varsity basketball team won against Naples, 68-37, Friday, Jan. 18. Mackenzie Strait netted 17 points, with nine assists, four rebounds, and four blocks. Makenzie Cratsley scored 15 points, with 20 rebounds and seven assists. Hallie Knapp added 14 points and 10 rebounds. Megan Sutherland had 13 points, followed by Dalaine Nolan with five points. Alyssah Newell contributed four points. The Lady Scots lost to Romulus, Wednesday, Jan. 16. The final score was 61-35. Strait led with 13 points, followed by Cratsley with 10 points and 12 rebounds. Knapp added eight points. Newell and Nolan both scored two points. Newell also posted eight rebounds. The Dundee boys varsity basketball team lost a close game to Naples, Thursday, Jan. 17. The final score was 64-61. Austin Gibson scored 15 points and Preston Cratsley 14. Isaac Seamans recorded 13. The Scots lost to Romulus in an away game, Tuesday, Jan. 15. The final score was 48-39. Cratsley scored 12 points, while Brandon Edmister had eight. Nick McCurry netted seven points. Gibson earned six points. Seamans, Peyton Boudinot, and Michael Hand each added two points. Dundee's Lily Hall and Matt Wood competed with Watkins Glen at the Hurley Indoor Track and Field Invitational held at Ithaca College Jan. 19. Hall was first in the triple jump (34'10.5", a personal record) and 13th in the 55 meters (8.18). Wood took third in the 3200 meters (10:44) and fourth in the 600 meters (1:31.7, a personal record). The Dundee varsity wrestling team faced both East Rochester and Red Jacket, Tuesday, Jan. 15. The Scots fell to East Rochester, 33-30. Michael Eaves (99) pinned Joshua Robinson in 0:40. Paul Knapp (132), Julian Heavner-Ortiz (138), Hayden Erick (145), and Kenneth Empson (170) won by forfeit. Dundee lost to Red Jacket, 45-18. Empson (170) pinned James Peterson in 1:20. Leif Hoyt (195) and Harry Nice (220) both won by forfeit. ARKPORT--The Lakers' girls varsity basketball team defeated Arkport/Canaseraga, 47-34, Wednesday, Jan. 16. Destiny Hammond scored 18 points, with six rebounds. Tea Flynn added 10 points and 12 rebounds. Ana Salom netted seven points, with six rebounds. Jillian Underhill and Maddie Sprague both scored five points. Underhill also added four assists and four rebounds. Shelby Sherman posted two points. Hammondsport secured a 45-16 win against Belfast, Monday, Jan. 14. Hammond led the Lakers with 18 points and seven rebounds. Salom scored 10 points, with six steals and five blocks. Flynn had nine points, followed by McKenzie Boscoe with four points. Underhill scored two points and had six rebounds, while Paula Garcia also netted two points. Sherman posted six steals. The Lakers' boys varsity basketball team pulled out a win against Arkport-Canaseraga, 41-39, Tuesday, Jan. 15. Michael Beam and CJ Hill both scored eight points for Hammondsport. ODESSA--The Odessa-Montour girls basketball team lost to Moravia, Friday, Jan. 18. The final score was 49-44. Olivia Grover led with 17 points. Sara Gardner followed with 10. The Indians' girls varsity basketball team lost to Watkins Glen, Tuesday, Jan. 15. The final score was 53-36. Gardner led with 12 points, all three-point shots. Grover posted nine points, followed by Kennedey Heichel with eight. Kara Reese scored four points. Lexi Saunders rounded out the scoring with a three-point shot. The Odessa-Montour boys varsity basketball team lost to Watkins Glen, Wednesday, Jan. 16. The score was 52-38. Zach Elliott had 11 points. Odessa-Montour's boys varsity swim team defeated Dryden, 102-67, Thursday, Jan. 17. "The O-M boys continue to impress with their aggressive swimming and versatility," said Coach Terri Brace. "Brett Walters validated his position as the ultimate utility swimmer tonight. With his win in the 100 freestyle, he has now taken first place in a dual meet in every individual event offered." The 200 medley relay team (Tyler Carson, Caleb Thomas, Johnny Niedermaier and Brett Walters) took first with a time of 2:06.30. The 200 free relay (Jake Mayette, Niedermaier, Micah Brewster, Bailey Hornbrook) was first in 1:46.04. The 400 free relay (Brewster, Hornbrook, Mayette, and Walters) also won first with a 4:14.19. Brewster placed first in the 200 free (2:22.36) and first in the 500 (6:17.94, a season best). Walters took first in the 100 free (56.29) and first in the 100 back (1:06.87, a season best). Hornbrook placed first in the 200 IM (2:30.73, a season best) and second in the 100 free (1:00.29). Mayette was first in the 50 free (25.57) and second in the 100 breaststroke (1:18.47). Niedermaier finished second in the 200 free (2:24.75) and 100 fly (1:20.50). The Odessa swimmers defeated Greene, 57-34, Tuesday, Jan. 15. The 200 medley relay team (Walters, Thomas, Mayette, and Brewster) was first in 2:03.82. The 200 free relay team (Niedermaier, Thomas, Mayette, and Hornbrook) took first in 1:50.72. The 400 free relay team (Hornbrook, Justin Ruocco, Justin Andrews, and Walters) placed first with 4:29.40. Hornbrook took first in the 50 free (26.23) and the 100 fly (1:10.40). Walters was first in the 500 free (6:10.55) and the 100 back (1:11.71). Thomas won the 100 breaststroke (1:22.10). Ruocco finished first in the 200 free (2:28.31). The Indians' girls varsity bowling team blanked Tioga, 4-0, Thursday, Jan. 17. Jackie Vincent led with a 517 series. Jana Arias posted a 507. Pixie Kinner bowled a 496, followed by Taryn Hoyt with 422. The boys lost, 4-0. Eric Rumsey bowled a 552. Austin Hoyt earned a 511. Dominick Elliott had a 452. Wes Wade posted a 419. The Odessa varsity bowling teams both lost, 4-0, to Union Springs/Port Byron, Monday, Jan. 14. For the boys, Rumsey bowled a 563 series. Elliott added a 388, while Hoyt posted a 371. Vincent led the girls with a 556. Kinner posted a 452 series. Dez Minnier followed with a 421. Arias bowled a 393. Hoyt added a 353. The Odessa-Montour/Watkins Glen varsity wrestling team won against Marathon, 30-21, Thursday, Jan. 17. Josh Bravo (220) pinned Chris Barned in 0:27. Andrew Hartford (126) beat Ethan Morrison by decision, 8-3. Josiah Lynch (138) topped Tim Morehouse in 0:46. Collin Haag (145) defeated Mike Wales by decision, 13-9. Dylan Houseknecht (285) and Jaden Smith (120) won by forfeit. WATKINS GLEN--The Watkins Glen varsity bowling teams both topped Elmira Notre Dame, 4-0, Friday, Jan. 18. Wyatt Brower secured a 613 series for the Senecas. H. Nathaniel Rose posted a 570, while RJ Bannon had a 521. Dylan Markley and Wrett Brower both bowled a 473. Casen Weeden added a 461. For the girls, Nikole VanDyke posted a 557. Hayley Cornish added a 503. Nancy Jackson earned a 451, followed by Alyiah Clink-Bentley with a 422. The Senecas' varsity bowling teams beat Marathon, Thursday, Jan. 17. The girls won 4-0. VanDyke led with a 521 series. Jackson earned a 443, while Cornish scored a 434 series. Clink-Bentley added 430. Makenzie Kellogg posted 382 and Brooke Usher earned a 352 series. Wrett Brower led the boys with a 554. Wyatt Brower bowled a 508 series, followed by Rose with a 506. Bannon added 479. Markley earned a 393 series. The Watkins Glen varsity indoor track team competed at the Hurley Indoor Track and Field Invitational held at Ithaca College Jan. 19. The girls placed ninth in the small schools division, while the boys were 13th. Allison Gibson placed second in the high jump (4'6"), fourth in the long jump (15'2", a school record), and ninth in the 55 meter dash (8.09). Kai Sutterby took fourth in the 1000 meter run (3:29.65, a personal record). Haley Dean finished eighth in the 300 meter (48.86). Breanna Carl was 12th in the 1500 meter (6.03.52). Jill Cantieni was 14th in the weight throw (17'.25", a personal record), while Brianna Hayes took 14th in the long jump (12'11.5", a personal record). Gabe Planty was first in the 3200 meter (9:56). Nick Wilston finished ninth in the long jump (18'4.5") and 17th in the 55 meter (7.55). Sam Thorsland was ninth in the 1600 meter boys (5:14.87, a personal record). Lance Majors took 12th in the 600 meter (1:39.59). The Watkins Glen girls varsity basketball team defeated Odessa-Montour, 53-36, Tuesday, Jan. 15. Adrienna Solomon led with 14 points and 11 rebounds. Taylor Kelly followed with 12 points and 10 rebounds. Danielle Leszyk added 10 points and four rebounds. Hannah Morse scored eight points, with eight assists. Kelsey Kernan earned five points and four rebounds. The Watkins Glen boys varsity basketball team defeated Odessa-Montour, Wednesday, Jan. 16, 52-38. Owen Scholtisek and Isaac McIlroy led the scoring with 13 and 11 points.